Experiential learning has value across the disciplines. Educational research has shown this method as one of the foremost ways to train students, and these ideas have been particularly influential in minting new scientists and engineers. These curricula regularly ask students to engage with project-based learning, which situate classroom skills in real-world problems. More innovative pedagogical approaches have included asking students to engage with stakeholders as part of their research before the experimental or product design stage has been reached. As a scholar of science and technology studies, this approach strikes a chord with me because of its resonance with the concept of tacit knowledge, the idea that some knowledge cannot be obtained through language via a text or oral communication. Experiential learning acknowledges those skills and ideas which we are not able to transfer to students via additional reading, more problem sets, or highly detailed project assignments. I teach interdisciplinary courses in the borderlands of art and science, and the value of these experiences students is evident in their feedback and in the quality of work they produce during the courses. 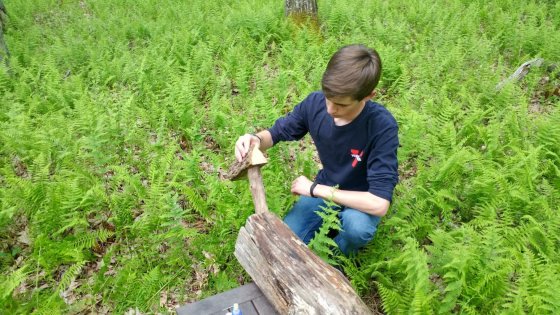 Biologists and environmental scientists have codified out-of-the-classroom experiences into their curriculums through the use of field stations, which serve both as sources of data and libraries of specimens. These off-campus satellites serve as places of incubation for complex problems which involve multiple organisms not readily studied in the laboratory context. These ideas are strikingly similar to the situations encountered by artists and writers going to residencies. A new environment inspires to ask new questions and to better understand those questions in context. Taking art and creative writing students into new contexts means seeking opportunities for community engagement, which is parallel to, but I would argue distinct from the engineering pedagogies’ stakeholder engagement. What is less common are the pedagogical possibilities of such semi-structured time for student-artists to engage an unfamiliar environment as part of the creative process. As a poet and a scholar of the culture of the life sciences, it is important to me to think about the ways that being immersed in a new place might inspire my students, and universities have already invested a great deal of resources in such stations. While field stations are more accustomed to the needs of data-gathering classes, I have found ready partners among scientists who are interested in new perspectives on the subjects of their research, as well as a willingness to share their expertise as students are oriented to a new place. This willingness to cooperate surely derives in part from the pressure university resources are constantly under to serve an interdisciplinary population, but I believe that it also issues from the traditions of field stations which regularly see researchers from a wide variety of disciplines. Conversations with students and a willingness to allow scientists to engage with student portfolios in presentations or even public settings can be crucial to continuing these collaborations. I have taught nine courses at three science field stations over the course of four years. My first appointment was at the University of Virginia’s Anheuser-Busch Coast Research Center (ABCRC) in Oyster, Virginia. The course was part of the Long Term Ecological Network efforts of Dr. Art Schwarzschild, with whom I co-founded “A Sense of Place.” The program began in 2013 and added additional instructors over the four-year life of the program, including Drs. Jennie Moody, Matthew Eisler, and John Casteen. Soon after this program was initiated, I began teaching courses at Mountain Lake Biological Station and Highlands Biological Station. These courses require students to engage to interview and shadow scientists, to learn from community members through visits to local museums, community centers, music and craft events, and guest speakers, and to consider the natural world through hikes, boat rides, and time for reflection outdoors. Course outcomes include portfolios of writing and artwork, as well as public events, which allow students to share their work with the people who have helped them learn about the place where they have studied. Students worked in teams and as individuals to create work in a variety of genres. While it is possible to trace loosely the way that exposure to ideas from eco-art, tactical media, and situationist practice found their way into the student work, no specific engagements were required. Instead the form of the work found roots primarily in the subjects the students encountered at the research stations and in their time outdoors. 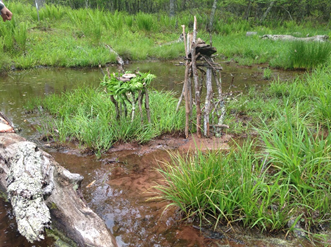 Through these experiential learning courses, students have created musical compositions based on field sound recordings, collages of DIY oyster gardening manuals, poetry about barrier islands, interactive sculptures set on Salt Pond, and eco-art inspired installations based on what they learned about the effects of the overpopulation of deer on Appalachian forest ecology (Fig 1). Figure 1. Curtis Davis creating Deer in the Ferns. Mountain Lake Biological Station. Summer 2016. A team of UVA students, Curtis Davis, Presley Day, and Louis Thomas, at Mountain Lake Biological Station created wooden deer to remind station inhabitants of the impact of these animals who are overpopulated because humans have removed their primary predator and which, in turn, eat most of the small plants on the forest floor, leaving only ferns. Figure 2. Sticks and Stones installation created at Salt Pond. Mountain Lake Biological Station. Summer 2016. Another group of Mountain Lake students, Marrisa Patrick, Will Rupp, Coral Kazaroff, and Martha Sheridan, created Sticks and Stones (Fig. 2) a group of in situ nest towers accessible through a small marsh or after a paddle across Salt Pond, which metaphorically investigate the relationship between the natural and the made with different weights of stones and lengths of sticks. The towers reflected their studies of ecoart and the group’s interest in ephemeral work: the sticks and stones were found in the area of the installation so they will, over time, return to their original environments. With a different ecosystem in mind, students at the ABCRC created projects with the coastal environment in mind. “Sense of Place” students collected seashells from barrier islands (Fig. 3). Students went on a boat trip and were impressed with the size and variety of shells which washed up onto the tiny barrier islands. Subsequently, the student pictured created a collage called “Oyster Gardening,” about oyster restoration efforts. Figure 3. 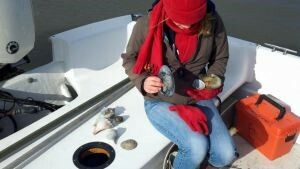 Emily Beacham (Sense of Place student) examines finds from walks on the barrier islands. Anheuser-Busch Coastal Research Station (ABCRC). January 2013. My courses have been taught outside of regular semesters, during January and summer terms. This maps onto the life of most university field stations, which are most active when scientists are available to be away from their own teaching duties. The benefits of taking students not only out of their usual places but out of their usual schedules are considerable. The focus of a single course for a shorter period means that students can mix a variety of learning experiences which would not be possibly with a full slate of courses and a complement of extra-curricular activities and course/experience responsibilities. For art and creative writing students, this more flexible schedule is an opportunity to develop habits for creative practice. By simultaneously pacing work through peer and instructor feedback, while also allowing for time to “wander and wonder,” field courses have the potential to help students discover their own most effective work methods. As suggested by studies of experiential learning, I have found that asking students to reflect on the ways that tasks which did not directly contribute to their portfolios is fundamental to encouraging students to recognize their own creative processes and enabling them to articulate the ways in which experiential learning shaped their creative outcomes. Experiential learning is distinguished from hands-on learning because it asks students to think about how these experiences fit in with their broader learning objectives and careers (or even lives). Placing new knowledge in context is fundamental to the experiential learning cycle since it asks students to think through what they would like to learn next and how they might go about this. There are many ways that reflections might be incorporated into the curriculum. I have done this in two primary ways. First, I require students to keep a journal of their days throughout the course and to read their entries in class. I then ask them to draw on these short writing pieces when constructing their artist statements and/or portfolio cover letters. By documenting their ideas as they unfold, students are more likely to recognize the ways that conversations, hikes, supplemental reading, and peer feedback shape their processes than if they were asking to create those connections without a record of their prior activities. Secondly, students are asked to specifically enumerate their influences as part of the public or station-wide presentations of their work. At Mountain Lake, this takes the form of a public reading attended by all station scientists and students. At the ABCRC, students present to a local audience at the Barrier Island Center (BIC), a local history and culture museum. At Highlands Biological Station, the Highlands’ Nature Center and Botanical Gardens host the final class reading. While each of these locations draws a slightly different audience, students are asked to think about the people and the experiences they provided as part of the presentation of their work. This frequently takes the form of expressing gratitude to experts, both scientists and local people who provided knowledge of the organisms, ecosystems, landscape, and culture, who have made specific contributions to their time at the station. While less formal than the first requirement, this public acknowledgement frequently results in a genuine contemplation about the role of context, collective knowledge, and hands-on learning in shaping personal creative processes. The recognition of the role of relationships, the affordances provided by new places, and opportunities for reflection on work methods are vital to maximizing experiential learning. Instructors can help to facilitate these possibilities by providing opportunities for students to structure their own time and to learn by doing in new environments. Thank you to my collaborators: Drs. Art Schwarzschild, Edmund “Butch” Brodie, Henry Wilbur, Eric Nagy, James Costa, George Cahen, and the many students from whom I have learned. Kolb, D. A., & Fry, R. E. (1974). Toward an applied theory of experiential learning. MIT Alfred P. Sloan School of Management. Cantor, J.A. (1995). Experiential Learning in Higher Education. Washington, D.C.: ASHEERIC Higher Education Report No. 7. Chapman, S., McPhee, P., & Proudman, B. (1995). What is Experiential Education?. In Warren, K. (Ed. ), The Theory of Experiential Education (pp. 235-248). Dubuque: Kendall/Hunt Publishing Company. Polanyi, Michael (1966), The Tacit Dimension, University of Chicago Press: Chicago, 4. Moon, J.A. (2004). A Handbook of Reflective and Experiential Learning: Theory and Practice. New York: RoutledgeFalmer.